Look Back in Anger interviews at Derby Theatre. – East Midlands Theatre. Look Back in Anger interviews at Derby Theatre. 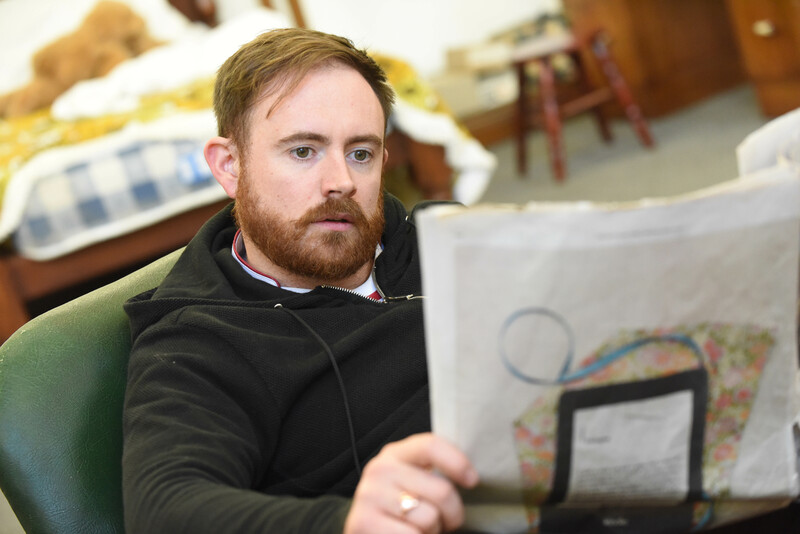 East Midlands Theatre writer Phil Lowe went over to Derby today to chat to two of the actors in Derby Theatre’s forthcoming and eagerly anticipated main house production of Look Back In Anger. Spookily John Osborne’s Derby based tiny flat (where he wrote the play) overlooks the rehearsal space on Green Lane. Many thanks to Heidi McKenzie and Sarah Brigham for the opportunity. 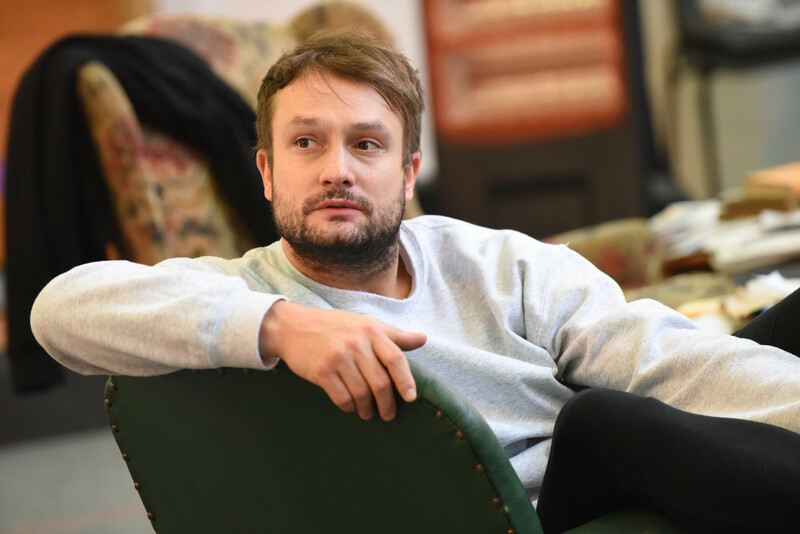 In a rehearsal break Phil asked actors Jimmy Fairhurst (Cliff) and Daisy Badger (Helena) about how they see their roles in the famous play that is dominated by the character Jimmy Porter. Phil: How can an interview about Look Back In Anger not be about Jimmy Porter? Well that’s a good question. I suppose in my questions I really want to find out more of how you perceive your characters as individuals not just as personalities that tolerate a rather overbearing main character. I asked Daisy how she felt about her character coming into the Porter household in the midst of rather a fraught Sunday afternoon. Daisy: I feel as though the world that Helena occupies is very different domestically, socially mannered and politically (almost). It is a completely different sphere to her. Initially Helena spends a lot of time sussing it out. The people in the Porters’ flat are like different animals to her. She is curious how it all works. It seems to work even when they are very often at odds with each other. Phil: As your character is an actress do you think that part of her is interested artistically in this social den of angst and anger? Daisy: Yes! Fascinated! It functions but how? She is compelled to dig deeper. Moving over to Jimmy Fairhurst (Cliff) I was curious as Jimmy Porter’s co-worker and mate how he felt he fitted into this social jigsaw. Jimmy: He works with Jimmy P on the sweet stall and I think he’s been friends with him for a couple of years when the play opens. The back story that we’ve looked at is based on Osborne’s own autobiography. My character seems to be a combination of two people; John Reese who was an actor who was living in Osborne’s house at the time and another friend called Anthony Creighton. John Reese was Welsh, as is my character, and was an orphan living in Cardiff in his childhood. The intense bombing during World War Two saw him moved to the East Midlands and he possibly did some National Service when older. If we see John as Cliff then Jimmy Porter has some kind of fondness for him and tries to look after him in life. To Cliff, even if the Porter family unit has its problems it still remains an ideal – a family and a place to call a sort of home and for him not to be alone. Patrick Knowles as Jimmy Porter. Photo by Robert Day. Jimmy: Yes and a well read New Statesman reader and Cliff sees that as something to aspire to and the brawling and ‘excitement’ between Jimmy Porter and his wife Alison doesn’t affect him as much as you might think. Even though Jimmy Porter can be quite vile to women he does have some tenderness where Cliff is concerned. I think I say at one point “I love these two people very much” and that is a genuine moment of affection. Cliff craves company and probably goes round every Sunday and a lot of the time he acts as a referee. Daisy: Yeah… Cliff has found a way to appease and referee as you say whereas my character is a probing poking personality going “What are you doing? Why are you doing it?” I ask the questions that an audience might be thinking maybe. 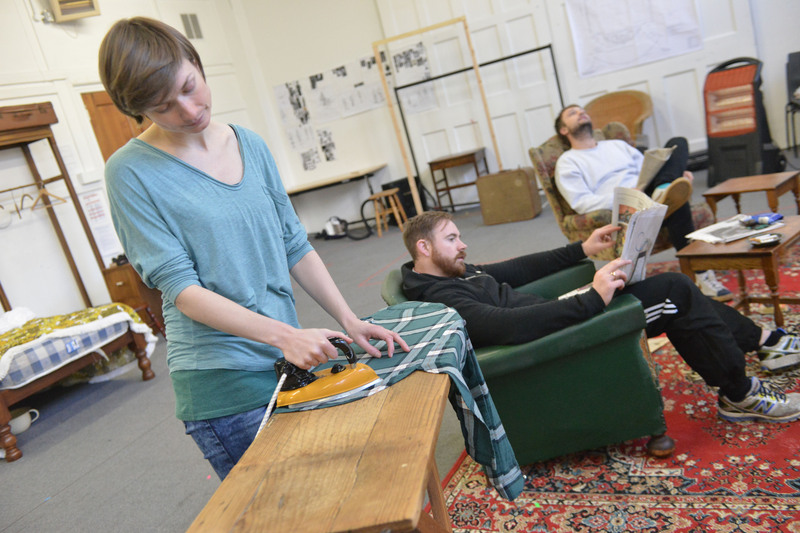 Look Back in Anger rehearsal in Derby Augustina Seymour, James Fairhurst & Patrick Knowles. Photo by Robert Day. Daisy: Especially in 1956!!! Open relationships sexually?! Phil: Doesn’t Jimmy Porter refer to an effeminate friend of his as a ‘female Emily Bronte’? Daisy: Webster! Yes, that’s right. Jimmy: There are a lot of great characters in this play who are just talked about like the Rhinoceros mother. Phil: Does the Colonel appear in this at all? Phil: A small but significant role I guess. Now Daisy… your character, as we have said, she comes in and tries to poke around in the messy Porter relationship which is quite a brave stance for anyone to take with someone as volatile as Jimmy Porter. Daisy: I don’t think she sees herself as someone who is particularly brave at all. I think she just faces up to stuff whereas these guys seem to skirt around the blatant problems. I just show ‘it’ like a mirror – look what you’re up to! I don’t think she’s brave at all. Just straightforward. Jimmy: Cliff is like making do. Trying to make the best of the situation. Whereas you go “Well what is the situation – let’s dig deeper.” Two completely different ways of thinking about life. The dynamics whether they are drawn from real life or not are really high stakes in these relationships. Jimmy: Like life under a microscope and its getting hotter and hotter under that glass to the ‘enth degree. Daisy: To the ‘enth degree! We find ourselves alone on stage together at one point don’t we? 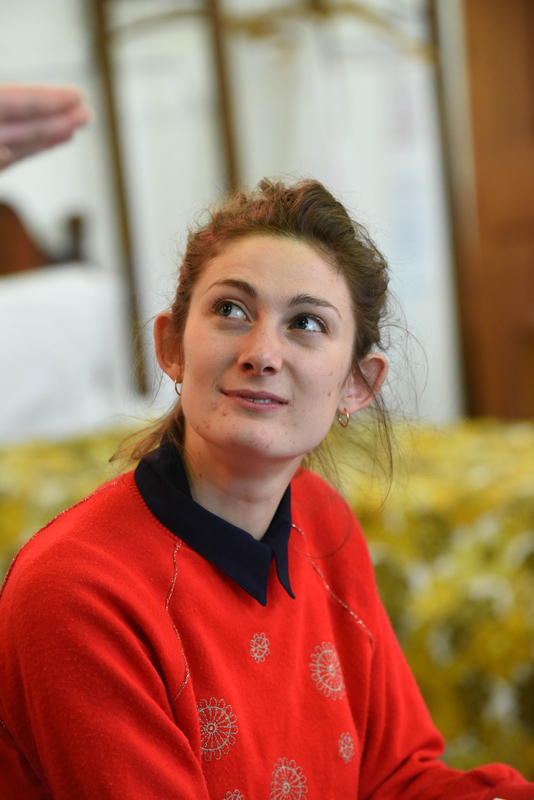 Daisy: For the first time and realise that we’re on stage together in ‘this room’ together and it is very strange because there is no Jimmy or Alison Porter around over half way through the play. Phil: When your character finally and perhaps unexpectedly gets into a relationship with Jimmy Porter how long has that been going on between acts? Daisy: We think its about three months. Time enough for our honeymoon period as new lovers to be transparent. Phil: Remind me, was Jimmy aware that his wife was pregnant? Phil: Do you consider that your character – Helena the actress – has been working in the theatre at the time of the story? Daisy: I think she has been yes. I don’t think that she would let a man get in the way of her career. I think that her ‘super -objective’ is that she wants to live life by her own dictum. I think that it is temporarily enough for her to have Derby (where there is NO society) as a base in 1956. And perhaps she does go off to get that job in Birmingham to further her career. Or maybe Jimmy is her magnet that draws her back. We shall see! Look Back In Anger is directed by Sarah Brigham. Review: Rambert at Nottingham Theatre Royal.